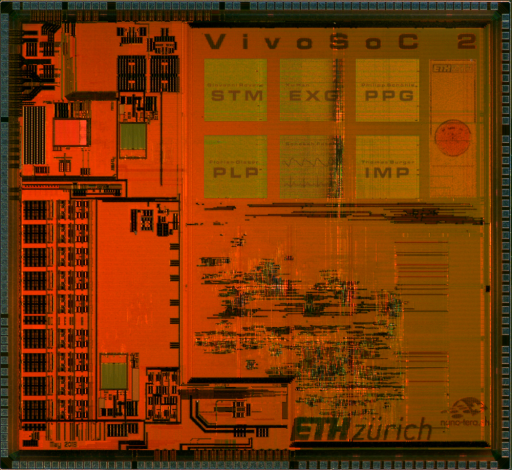 The VivoSoC 2 project is the extended and updated version of the original VivoSoC platform for biomedical signal acquisition. This chip is feature rich and designed to be potentially employed in different portable applications, e.g. : mass-market consumer fitness tracker, medical-grade teleheath point-of-care, implantable devices for chronic disease monitoring and management. To fit the tight energy budgets of portable devices, the operating point of each SoC block can be fine tuned to trade-off unnecessary precision with power. 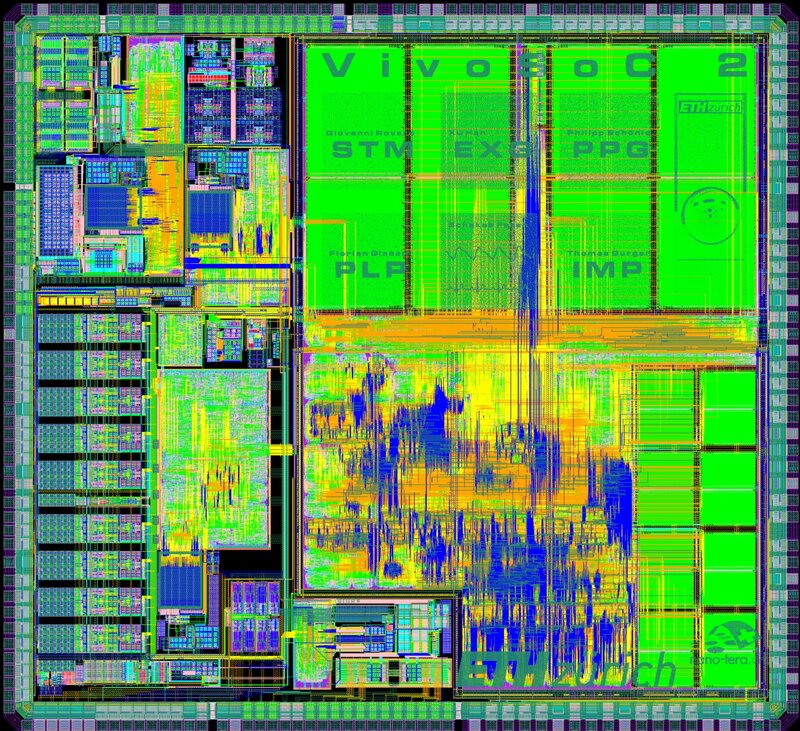 Quad-core RISC processor of the PULP family equipped with SPIs, UART, GPIOs, JTAG and I2C digital interfaces and a L2 memory of 128kB. PULP cluster and peripherals embedded in two independent voltage and clock domain regions to allow voltage and frequency scaling. 9-channels 12kHz-66dB analog-front-end for time-multiplexed ExG recording (with lead-off detection). 4-channels Transimpedance Medical Amplifier and LEDs driver for photoplethysmogram (PPG). 3 fully flexible SAR-ADC for digitizing biomedical signals (ExG, PPG, bio-impedance). 6-channels nerve blocking and stimulation circuit. General purpose algorithmic ADC for auxiliary sensor recordings. On-chip LDOs to provide a clean supply for the analog circuits.